Our patient-level booklet helps inform lung cancer patients, their families and their carers about the level of care they can expect. We have worked closely with Roy Castle Lung Cancer Foundation, and patients, to create this booklet which showcases the results from our 2017 annual report. 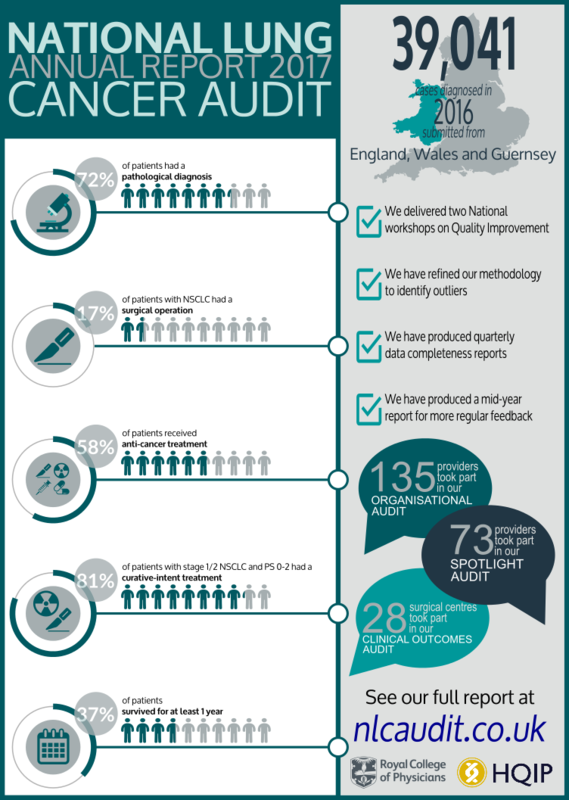 The National Lung Cancer Audit 2017 report demonstrates the key findings from the 13th annual audit for lung cancer patients diagnosed in 2016 in England, Wales and Guernsey. The purpose of the audit is to review the quality of lung cancer care, to highlight areas for improvement and to reduce variation in practice. The mid-year report is designed to give trusts an opportunity to review their interim results before the full publication at the end of the year. This is the first report and covers the period July 2015 - June 2016 inclusive. Being the first such report it is not publically available, but was sent directly to local lung cancer clinical leads. The National Lung Cancer Audit report 2016 demonstrates the key findings from the 12th annual audit for lung cancer patients diagnosed in 2015 in England, Wales, Guernsey and Scotland. The purpose of the audit is to review the quality of lung cancer care, to highlight areas for improvement and to reduce variation in practice. We have produced our first patient-level booklet to help inform lung cancer patients, their families and their carers about the level of care they can expect. Working with the Roy Castle Lung Cancer Foundation we consulted lung cancer patients, their carers and their families to help us write this booklet, which showcases the results from our 2016 annual report. The NLCA annual report 2015 provides a summary of comparative audit data on the treatments and outcomes for lung cancer patients who were first seen in NHS secondary care in 2014. The NLCA annual report 2014 provides a summary of comparative audit data on the treatments and outcomes for lung cancer patients who were first seen in NHS secondary care in 2013.